Chris “Hush Money” Hani. Walter “The Sweetener” Sisulu. Joe “Mr Ten Percent” Slovo. Steve “Kick-Back King” Biko. Oliver “On The Take” Tambo. Embedded in five separate plaques, one below the other, these inscriptions and the image as a whole were what most stayed with me from Brett Murray’s provocative exhibition – Hail to the Thief - which closed at the Goodman Gallery in Cape Town last week. One’s first reaction to these – and I imagine, that for some, it will be the only reaction – is that the artist is dishonouring the memory of these struggle icons. There will be many who play the tiresome race card and shoot the white messenger artist for his “racist attack” on black struggle heroes. When the emotional dust settles, and the politically correct (or rather, the politically opportunistic - where blackness is appropriated as a smokescreen under which to pursue and justify dubiously-gotten gain) knee-jerk reactions subside, the realisation dawns that Murray is but giving artistic expression to what even the ruling party’s closest political allies have been vociferous about. Murray’s “President and Sons Ltd” or his “Hail to the Thief” iconography echoes COSATU’s Secretary General Zwelinzima Vavi’s anger last August when he was particularly scathing about the ArcelorMittal Sishen mine deal in which family and friends of President Jacob Zuma received shares worth millions. “We’re headed for a predator state where a powerful, corrupt and demagogic elite of political hyenas are increasingly using the state to get rich” said Vavi and continued that just like the hyena and her daughters eat first, the chief of state’s family eats first in a predator state. Vavi’s anger, frustration and disappointment expressed in “We have to intervene now to prevent South Africa from becoming a state where corruption is the norm and no business can be done with government without first paying a corrupt gatekeeper,” reflects the anger and frustration themed through this exhibition. Murray was a participating artist in the Arts Festival 86: Towards a People’s Culture of which I served as coordinator and which was banned before its start for constituting “a threat to the national security” of the apartheid state. Little did the artists in that event believe that less than 25 years later they would have to raise a flag again in protest, in anger and disillusionment against those in the new political and economic elite who now dishonour the struggle against apartheid injustice and the heroes of that struggle, with their corrupt, scandalous behaviour that spits on the half of our population who continue to live below the poverty line. 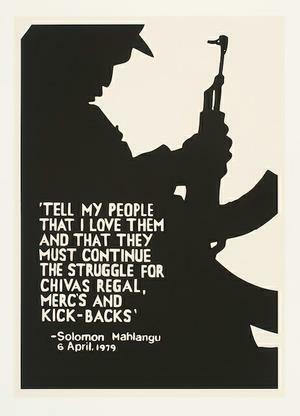 Solomon Mahlangu, an ANC guerrilla who was hanged in 1979, and who was posthumously awarded the Order of Mendi for Bravery in Gold for bravery and sacrificing his life for freedom and democracy in South Africa in 2005, has his words on the day of his death reshaped by Murray in a poster “Tell my people that I love them and that they must continue the struggle for Chivas Regal, Mercs and kick-backs”. There is now a school and a square in Mamelodi named after Solomon Mahlangu, as there are streets, parks and buildings named after Steve Biko, Chris Hani, Walter Sisulu, Joe Slovo and Oliver Tambo - monuments to honour their dedication to a better life for all, and to remind us of our unjust, institutionally violent past so that we do not repeat it. And yet, here we are, nearly seventeen years into our post-apartheid democracy, and we are the country with the world’s widest gap between rich and poor, with the worst indictment of the ruling party being average life expectancy for black people which now stands at around 50, twelve years less than in 1992 before it took over the reins of government in 1994. Contrary to the ANC’s election promise of “a better life for all”, the reality has been “an obscenely better life for an elite, and a shorter life for most”. What, then, is the point of such monuments, streets and public buildings named after fallen struggle heroes? Did the numerous holocaust museums prevent subsequent genocides? Did the Women’s Monument in Bloemfontein commemorating thousands of Afrikaner women and children who died in British concentration camps prevent the apartheid government from assigning millions of black women to insufferable living conditions in bantustans? Has the Baragwanath Hospital significantly improved access to public health care for the majority of our country’s inhabitants since being renamed the Chris Hani Baragwanath Hospital? If anything, such memorialisation simply provides those who once were victims the “right” to abuse others in their attempts to ensure that they are never victims again, or that they prosper – even at the expense of others - from once having been victims of injustice. Perhaps, then, we should have living monuments that challenge those in power and us as citizens on a daily basis to confront the injustices in our midst and truly to transform the lives of all so that we all enjoy in practice (not simply on paper) the rights and freedoms contained in the Universal Declaration of Human Rights and in our own country’s Constitution. Imagine, for example, every street being given a second name – that of person who’s died of AIDS-related causes under the Mbeki regime (that would provide more than 300 000 street names) and only as health and educational interventions succeed in reducing HIV infections and average life expectancy increases, are these names removed, one-by-one until we have an average life-expectancy of at least 70. Or imagine, in big public spaces – the Waterfront in Cape Town or Sandton Square in Johannesburg – two walls, one listing (on a weekly basis) the millions of names of people who have lost their jobs after 1994, and the other listing the people who have been employed. Or imagine every school being renamed after a (particularly, black) matriculant who actually found a job after completing school: how many schools will be left unnamed? Perhaps these living monuments will drive us to action, whether through shame, guilt or real commitment to a better life for all. It is in how ordinary, particularly poor, people’s lives have been transformed after 1994 - fundamentally and sustainably - that our honouring of struggle heroes and icons will proved, rather than in how many streets, buildings or parks we name after them. While the political and economic elite – “predatory hyenas” - continues to indulge at the expense of the majority thereby dishonouring the struggle against apartheid’s injustices and mocking the sacrifices of the icons of that struggle, the work of artists like Brett Murray is not only necessary, it is imperative!